The fabrics are all 100% silk drapery fabric samples that a friend got for me a couple of years ago. 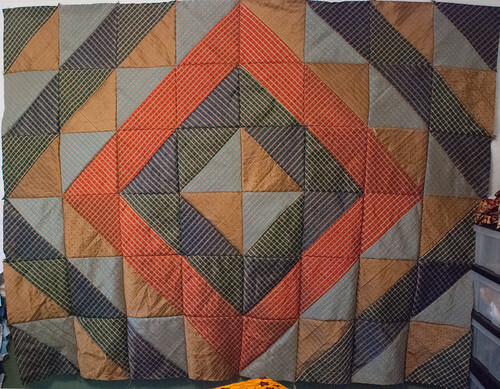 The color arrangement is one frequently seen in log cabin quilts. It's going to end up with jowilson, an old friend of mine who is a photographer. I have a goofy name in mind that I may or may not stick with, but it's clouding my judgment and I'm having trouble thinking of others. Jacob has suggested "Focus Ring" or "Lens Flare." "Red Square" has been stuck in my head. Anyone else got any ideas? "Hearth" jumped immediately to my mind.